As we shared a few weeks ago, our Walt Disney Imagineers are busy putting the finishing touches on Princess Fairytale Hall in Magic Kingdom Park. This exquisitely detailed Disney Princess character greeting location is the next to debut as a part of the New Fantasyland expansion – and we’re happy to share today that the Hall will officially open its doors on September 18. As a reminder, Princess Fairytale Hall will offer two separate character greeting experiences, which means there are two queues to choose from. You can choose to meet either Cinderella or Rapunzel, each of whom will be joined by one fellow Disney princess. And yes, Princess Fairytale Hall will offer both traditional Disney FASTPASS and the new Disney FastPass+ options. Join the conversation online with the hash tag #NewFantasyland on Twitter. First of all – Whoo Hoo!! Soo excited!! We will be there in January and my 4 year old will LOVE this. I am curious, however, if using FP+ this will count as one of your 3 picks? From my understanding, when using FP+ you can only pick 3 (or 4) a day…does this include charater experiences such as this or is that limit only apply to the rides?? I am looking forward to visit the Princess Hall in the future. Keeping up the good work. It’s nice they are getting a special place to see all the princesses, but I wish they would get more of the Disney characters you don’t see anymore. They are like the lost Disney characters. Don’t know the last time I saw Roger Rabbit or Jungle Book characters walking around the park. Would be nice to see ALL Disney friends once in a while. Will Merida be appearing at the Hall or will she still be at the Fairytale Garden? As to Noodle question…wanted to mention that Belle is also at the Storybook Princess Meals at Akerhurst Hall at Epcot and she is in the yellow dress from the pics I have saw posted. How close is this located to Mickey’s Philharmagic? It’s in the former location of Snow White’s Scary Adventures. We have a 4 year old granddaughter who is a princess fan through and through, Rapunzel especially. Do you have suggestions where we can see and possible dine with Rapunzel. We will be in Disneyland October 21 & 22. Thank you. Hi Jennifer! Thanks for posting this. 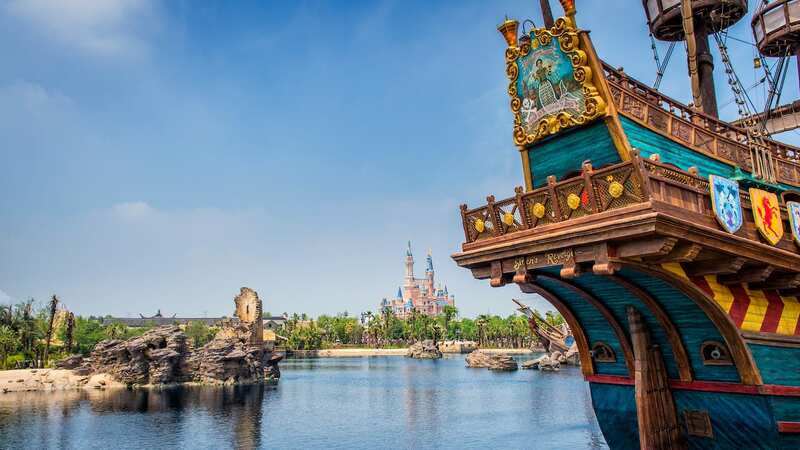 Will guests still be able to meet Tiana and Naveen at Liberty Square? And Aladdin and Jasmine in Adventureland by the carpets? I’ve been looking forward to this attraction ever since they announced it. So far the concept is beautiful! I’m a little thrown off about the choosing princesses part. Will Cinderella or Rapunzel be joined by a princess of your choice who you’d like to take a photo with? I’m asking as I’m looking forward to seeing princesses like Jasmine and Mulan. We’re going to be there for Opening Day and we’re so excited! Will Tiana and Prince Naveen still be greeting Guests in their location near Liberty Square? The best way to know the location of any character is to check the My Disney Experience mobile app or pick up a Times Guide on your way into the park the day of your visit. That will give you the most accurate info. This looks great and well-done (like always), but I am concerned about Belle only being available in her yellow dress at Enchanted Tales. I know she is in her blue dress at Epcot, but I wondered if there will ever be a chance to get time with Belle in her gorgeous yellow dress. Belle is my favorite princess, but at Enchanted Tales, I am always rushed through the photo taking time, and not everyone gets to have their picture taken with her. I know she cannot be at in two places at once, but I want a chance to see her in her yellow dress. Do you know any plans to have her meet elsewhere in the yellow dress? After all, Aurora never meets in her “peasant/ Briar Rose” dress, Tiana only meets in her ballgown, and Cinderella only meets in her ballgown, so I see no reason why Belle must remain in her provincial town dress. Ooops, i take that back it is there today. Glad i looked here! It looks wonderful, but it is still such a shame that a classic dark ride was sacrificed in the process. I really am grateful that the imagineers share concept art with us fans. I have been following this project for some time and I have loved seeing all the gorgeous drawings that have been released showing how the Fairytale Hall evolved. I wish they had this when my kids were younger because it makes it so easy to plan when a family can meet all the princesses. That sure takes a lot of stress off a mom, because having this Hall means that people can relax more on vacation without having to worry about finding the princesses walking around. I just think this is genius and also the end result looks beyond GORGEOUS. Well done!!! Very exciting news! Love all the Princess attractions, but what about the boys? Sure would love a Buzz and Woody character breakfast! I am so excited this will be open for my trip in October. Will this be open for the Halloween parties after the 18th? If so, will they be joined by their respective princes? Will there be Photopass Plus photographers to take pictures? I’m glad the princesses have a new home, I can’t wait to see who’s in town square theater now. I really hope it’s Bernard and Bianca from the Rescuers. The Rescuers is my favorite Disney Movie, and I’d love to see Bernard and Bianca in the Parks. Nevermind, it’s there to add as a FastPass+ selection now! I’ll be meeting Rapunzel and a “Princess Friend” on 10/12. Woohoo! Have fun on your upcoming trip! It looks gorgeous. And I am so happy there is no princess roulette. When will it be offered for FastPass+ online or through the mobile app? We plan to be there on the 18th! Do you know what time the Princesses will start greeting their guests? Will there be a ribbon cutting ceremony on the 18th? — Thanks! This is so cool! Do you know when it will be available to add to FP+? I just checked and it’s not listed yet. Thanks for the preview Jennifer! Question though, will Cinderella still be meeting guests in her castle? I assume you mean at Cinderella’s Royal Table? Yes, between greeting her guests at Princess Fairytale Hall, she will continue to meet with guests at the restaurant. Can’t wait to see this. Makes the character experience even better. Wow! I love these “sneak peek” videos because they really provide such great insight into the creative processes of the Imagineers! Amazing how every detail reflects the theme and the story of the attraction – so fascinating! Can’t wait to see Fairytale Hall during our next visit! Thank you! 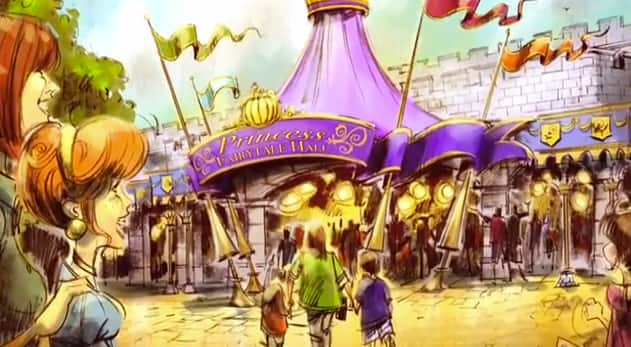 Our friends in Imagineering do a great job giving us these sneak peeks to share! question about the fastpass – since there are 2 separate lines will you need to get a fastpass for one line then another for the other line? and thanks for letting us know about the date!! Yes, there will be two separate FASTPASS options for guests to choose from: Rapunzel and a princess friend or Cinderella and a princess friend. (Also, the FASTPASS distribution for Princess Fairytale Hall will be located near Peter Pan’s Flight). Thanks for the sneak peek Jennifer. Any word on who will be taking the spot opening up on Main Street when the Hall opens? We don’t have anything to announce at this time. Don’t forget that Mickey Mouse will continue to greet guests in Town Square Theater!